Sales of the latest version of the bebionic hand are exceeding expectations at Steeper and Reliance is delighted to be continuing its strong supplier relationship with one of the world’s leading prosthetics companies as the bebionic range expands. Following on from its involvement in the design and manufacture of the original bebionic hand Reliance has continued to provide design support to Steeper during the 12 month development programme for the new small hand. For use by a female or teenager the latest hand has been designed to provide the same level of functionality as the original hand but lighter and in a smaller space envelope. The design has been undertaken by Steeper’s engineering team with Reliance acting as an industrialisation partner, giving feedback on the design in terms of manufacturability and commercial profile and providing prototype parts as the design progressed. Reliance supplies the finger actuation for the hand, providing a complete gear and leadscrew assembly, incorporating parts based on its catalogue product range including modified catalogue gears, manufactured by Reliance, together with a standard leadscrew and special, modified leadscrew nut. 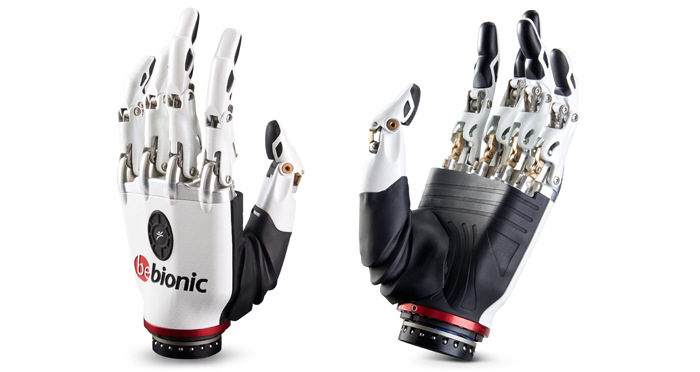 The design aim was to bring the original bebionic hand into a smaller space envelope, so the design of Reliance’s finger actuators is similar to the previous hand, providing the same strength per finger, but essentially miniaturised. Prototype development was completed in August – September 2014, with production ramp up from January 2015. The new smaller bebionic hand has now been fully commercially released and has already begun to open up new market opportunities for Steeper in Asia. Participation in the latest bebionic development continues to strengthen Reliance’s relationship with its Yorkshire neighbour, once again providing a bespoke assembly based around its catalogue product range and importantly the necessary engineering support to help bring Steeper’s new product to market successfully.